PT Kimia Farma Trading & Distribution - KTFD is a rapid growing pharmaceutical company in Indonesia with core business competencies in the field of trading and distribution of pharmaceutical products, including consumer health products (CHP), ethical products, and medical devices. KFTD is a directly-owned subsidiary company of state-owned pharmaceutical giant PT Kimia Farma (Persero) Tbk (Kimia Farma Group). 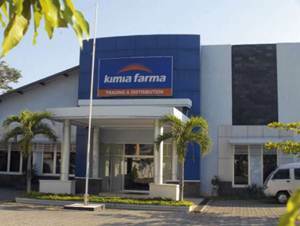 According to information found in KFTD's website as cited by JobsCDC.com, 99.99% of KFTD's shares are held by Kimia Farma Group. Other 0.01% remaining shares was owned by PT Kimia Farma Apotek. Headquartered in Jakarta, KFTD has 47 branch offices which serves more than 16,173 pharmacies, 1,319 drug stores, 6,387 free traders, 3,134 hospitals and 1,008 modern markets throughout Indonesia (as of December 2017). JobsCDC.com now available on android device. Download now on Google Play here. Please be aware of recruitment fraud. The entire stage of this selection process is free of charge. 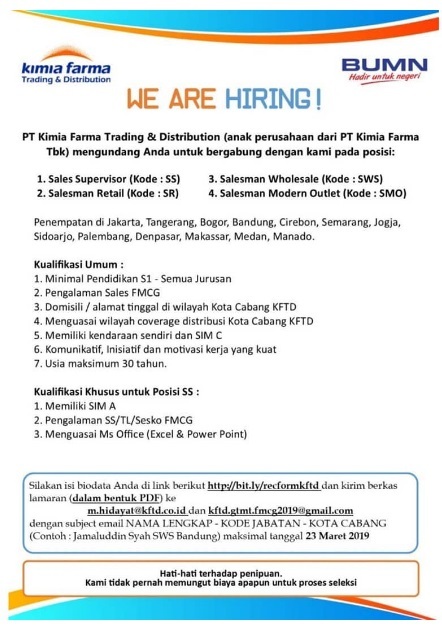 PT Kimia Farma Trading and Distribution - Staff, Supervisor KFTD Kimia Farma Group March 2019 will never ask for fees or upfront payments for any purposes during the recruitment process such as transportation and accommodation.